We need to start talking and networking – finding common ground and common language with the other people around us. We need to get together in groups and find language for our stories that make sense to us and leave us feeling good about ourselves. Unlearn social conditioning about what it means to be ‘sick’ and ‘healthy’. We need to reclaim our dreams and scheme up ways to make them happen. We need to share everything we’ve figured out about how to be a human being. We need to love ourselves as we are — crooked and intense, powerful and frightening, unruly and prone to mess around in the dirt — and understand that weeds are simply plants who refuse to be domesticated and displayed. We need to write new maps of the universes we share in common and find ways to heal together. We need to summon up everything we’ve got to create social webs and lasting support networks for ourselves and the people who will follow us. Think of this manual in your hands as a book of magic spells. It could help you conjure up the world you want to see. 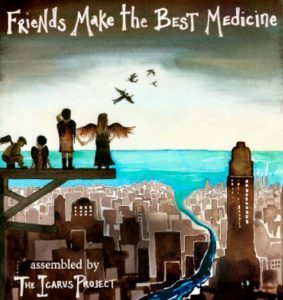 Download this Icarus project guide.